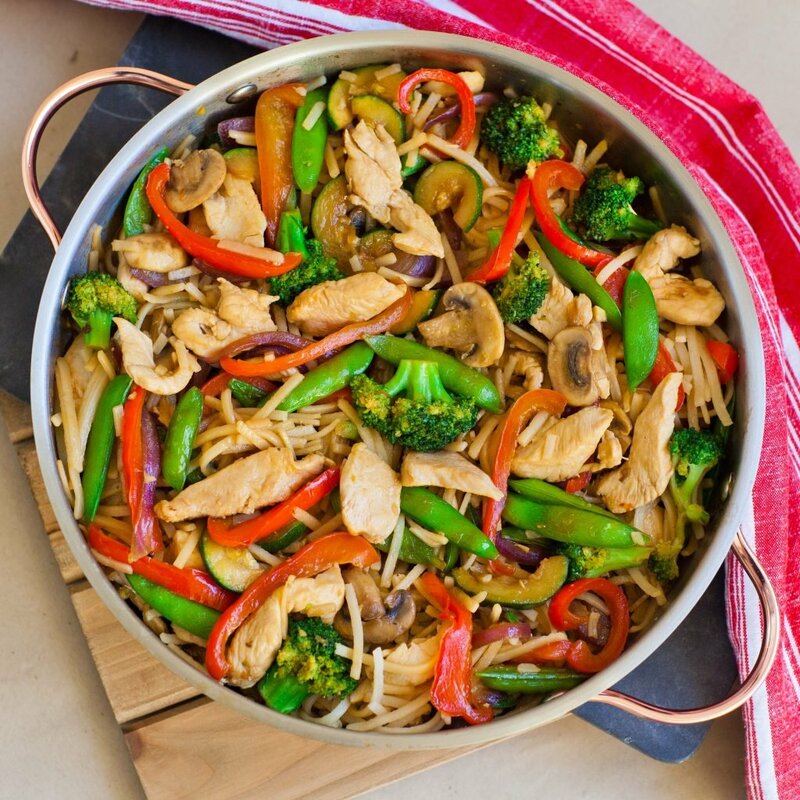 The best recipe for teriyaki chicken stir fry! This easy dinner recipe is made with home made teriyaki sauce, juicy chicken and loads of fresh vegetables! You can also add some noodles to the pan to make a heartier meal. This chicken recipe is one of my all-time favorites and for good reason! This chicken recipe will work with either chicken thigh or chicken breast. Toss in all of your favorite veggies such as cauliflower, sprouts, yellow zucchini, and eggplant. Feel free to serve the stir-fry over rice instead of adding the rice noodles. My husband always requests for noodles or chow-mein, but I prefer a side of white rice. 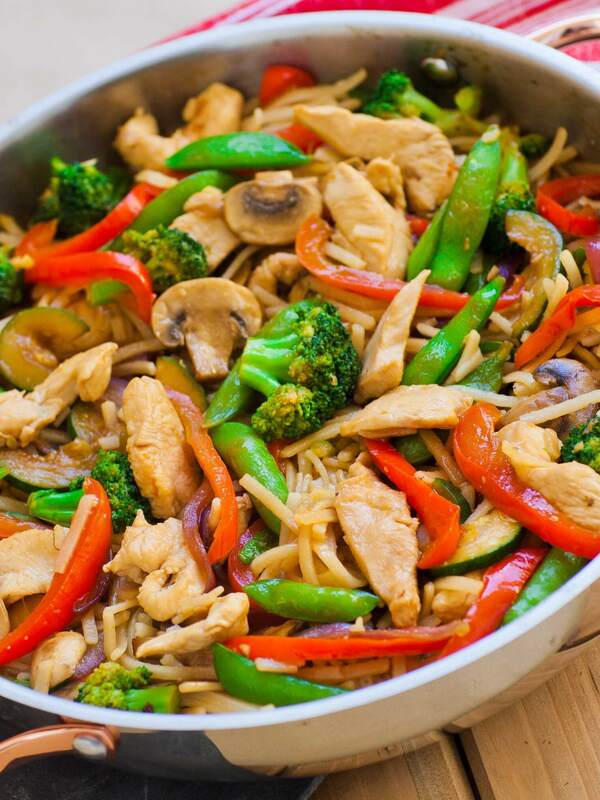 Whatever ingredients you choose to add to this stir fry, it’s going to taste amazing! I have a serious weakness for any recipe with the word ‘teriyaki’ in it! This recipe is one of our favorites and for a good reason – it’s unbelievably delicious! The sauce really makes this dish – it’s easy to make, not too sweet and bursting with flavor. I use this teriyaki sauce recipe for any recipe that calls for the bottled variety. Lately, I’ve been watching my sugar and cutting down on the amount added. You can reduce the sugar down to 1 tbsp if you’re watching your intake. Like this teriyaki chicken recipe? Try my super easy and delicious ‘Teriyaki Party Wings’ next! Also, try one of my favorite casserole recipes! My ‘Creamy Chicken Casserole’ is so delicious! This two-handle saute pan is similar to the one I have at home – great for just about everything! I love this set of glass mixing bowls for food prep. And you can never have enough silicone spatulas when cooking! My favorite Wusthof knife – Ikon hollow-edge santoku! Makes food prep fun and easy! Prepare rice noodles according package instructions; or, prepare white or brown rice to serve with the stir-fry. Keep warm until ready to serve. Mix all the ingredients for the sauce in a small bowl: brown sugar, soy sauce, water, sesame seed oil, vinegar, ginger (I use fresh ginger and mircoplane to create finely ground ginger) and minced garlic; set aside. Preheat a large frying pan over medium-high heat and add thinly sliced chicken breast or chicken thigh. Cook the chicken for 7 to 9 minutes, stirring often, until completely cooked. Remove into a large bowl and keep warm. In the same pan, prepare the vegetables in batches to prevent overcrowding. I like to prepare the onions and mushrooms together, bell pepper and snap peas, zucchini and broccoli. Cook each batch for 3 to 4 minutes or until vegetables reach desired doneness. Remove each batch into the same bowl as the chicken. Once all vegetables are cooked, pour the prepared sauce into the pan and bring up to a simmer. Simmer the sauce for 5 minutes, allowing the sugar to caramelize and thicken. Return all of the vegetables and chicken back into the pan and coat in the sauce. Continue cooking the mixture for a few more minutes for the sauce to season the ingredients. Add the rice noodles to the pan, if desired and toss to coat with the sauce. Alternatively, serve the stir-fry over rice. Made this today… absolutely delicious! Thank you for the recipe. This recipe is so Tastey! I been having problems with picky eatters, and as soon as I put this dish down, they were so happy. They ate it all up! I ate 2 full plates myself. Cannot wait to make again! I made it with thin spagetti. Can I use white vinegar instead of rice vinegar? Yes, I think that would work fine, too! Hi the soy sauce you use in your recipe is dark soy sauce or light soy sauce ? Awesome! 🙂 So glad you both enjoyed it! This is way to sweet. Swing and a miss for our family dinner. Very disappointed. So sorry that you didn’t enjoy the recipe.